Africa is historically known as the Cradle of Humankind and, in the 21st Century, the continent will be the birthplace of incredible animation. That is if Toon Boom Animation, the African Animation Network (AAN) and studios Toonz Media Group and Baboon Animation have anything to say about it. The international industry powerhouses are leveraging education to build a sustainable African animation industry with DISCOMICS Iqembu. 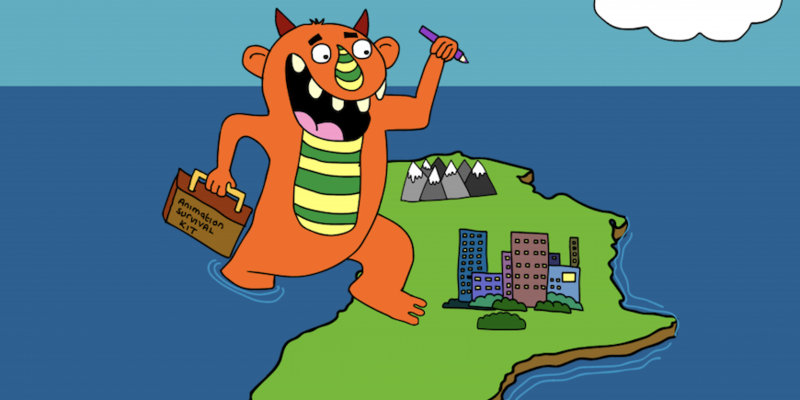 Developing the region’s industry is central to the African Animation Network’s mission. The continent has massive potential to create and consume cartoon content; Sub-Saharan Africa is the world’s fastest growing mobile market, opening up streaming to an audience that is 75 percent 25 years old or younger. In fact, Africa is the world’s youngest continent, with untapped artistic and human resources to propel it onto the international animation stage. The central notion is a training pipeline that takes young talent from pedagogy to practical experience, leading to employable animators and functioning service studios. AAN will co-develop several curricula, including one for animation production (Toonz Animation Fukamela) and another for specialized animation writing (Baboon Animation Fukamela). After approximately six months, the Toonz Animation Sheshisa and Baboon Animation Sheshisa will launch. Both Toonz Media Group and Baboon Animation will supply service work to sustain the talent pool, pipeline and infrastructure. Toon Boom Animation is also partnering with AAN will to co-develop a specialized 2D animation curriculum with Toon Boom Storyboard Pro and Toon Boom Harmony: the Toon Boom Fukamela. This will include training for creative leads and trainers. Once said creative leads have completed training, the Toon Boom Sheshisa will launch alongside an internationally accredited Toon Boom Centre of Excellence. Participation and submission requirements for DISCOMICS Iqembu will be announced in early 2019. To explore the DISCOMICS Iqembu further, Toon Boom Animation sat down with Nick Wilson, head of projects and content AAN and co-founder of DISCOMICS. Hi Nick! What inspired you to co-found DISCOMICS? NW: At the end of 2017, having launched AAN and run initiatives across the continent, [DISCOP Markets CEO] Patrick Zuchowicki and I had a debrief on the success of the previous year and how we could expand on that. We’d raised some sponsorship and resolved to use it to maximize what we’d developed and to achieve common goals. We decided to start a new enterprise with AAN and DISCOP Markets as partners: DISCOMICS. We also strategized to bring animation’s sister industries like comics, game development and esports under the DISCOMICS umbrella. There is a burgeoning subculture in Africa for these new media industries, with a wealth of talent that has not yet been given an audience. 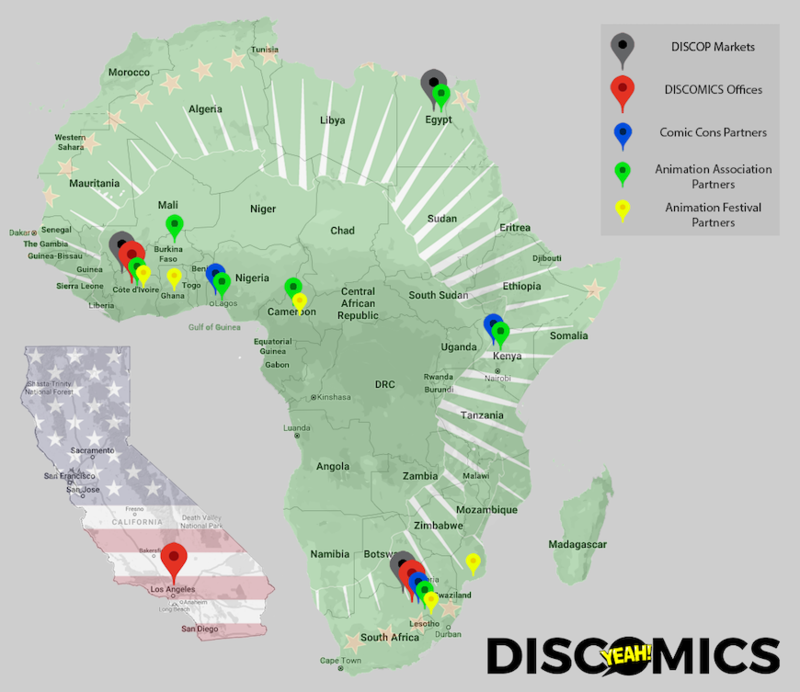 As the premiere content market in Africa, DISCOP is the perfect place for us to create our platform. When developing DISCOMICS Iqembu, why did you select Baboon Animation and Toonz Media Group as studio partners? NW: The Baboon Animation team collectively are responsible for 27 Emmy Awards and numerous Oscar nominations. I think it was more a case of Baboon Animation selecting AAN than the other way round! We’re honoured to have them as partners and learning from their experience is going to be exceptional. India has arguably the world’s leading animation service industry and Toonz Media Group produces over 10,000 minutes of animated content annually. Their director of operations, Rathan Sam George, set up a meeting between their CEO, P. Jaya Kumar, and myself at Annecy in 2018 and it was immediately clear there was commonality between what they hoped to achieve in Africa and AAN’s goals. They have a staff of around 500 full-time employees but have agreements with 35 studios in India, which means their entire production pipeline encompasses more than 4,000 animators. Still, they need additional capacity and that’s the work we’re aiming to secure and produce with DISCOMICS Iqembu. There is also an existing relationship between Baboon Animation and Toonz Media Group. They have collaborated on multiple projects and having AAN join the conversation creates a vital bridge between Africa and the global animation industry. And why was Toon Boom chosen as the software partner? NW: My background is as a software engineer and project manager. I understand the value of investing in a workflow that makes you exceptionally efficient. Toon Boom is that solution for the 2D animation industry. During a panel discussion at DISCOP Johannesburg, Rathan described how much more efficient Toon Boom is over other 2D software service providers. It was an off-the-cuff comment but it validated our decision to collaborate with Toon Boom. With Toonz Media Group, Baboon Animation and Toon Boom, we have three of the best partners in global animation and we're bringing that solution to Africa. Speaking of solutions, can you explain the Fukamela -> Sheshisa -> Iqembu pipeline more and how it will benefit young artists? NW: Effectively, we aim to graduate novices through the Fukamela/incubate and Sheshisa/accelerate processes to join the cluster — the DISCOMICS Iqembu. There will be an intake of talent annually via the Fukamela and Sheshisa, and they will be incubated by industry partners like Baboon Animation, Toonz and Toon Boom. Ultimately, we aim for this talent pool to be a functioning component of the DISCOMICS Iqembu. Once we have created capacity and have an efficient pipeline that is servicing work from Baboon Animation and Toonz, the DISCOMICS Iqembu will start focusing on developing and producing original African IP. Our two studio partners will invest in these IPs based on merit and on a project-by-project basis. This is an exceptional opportunity for African creatives to work with some of the top global animation showrunners. Is this part of developing a sustainable African animation industry? NW: Yes, it is essential to it. 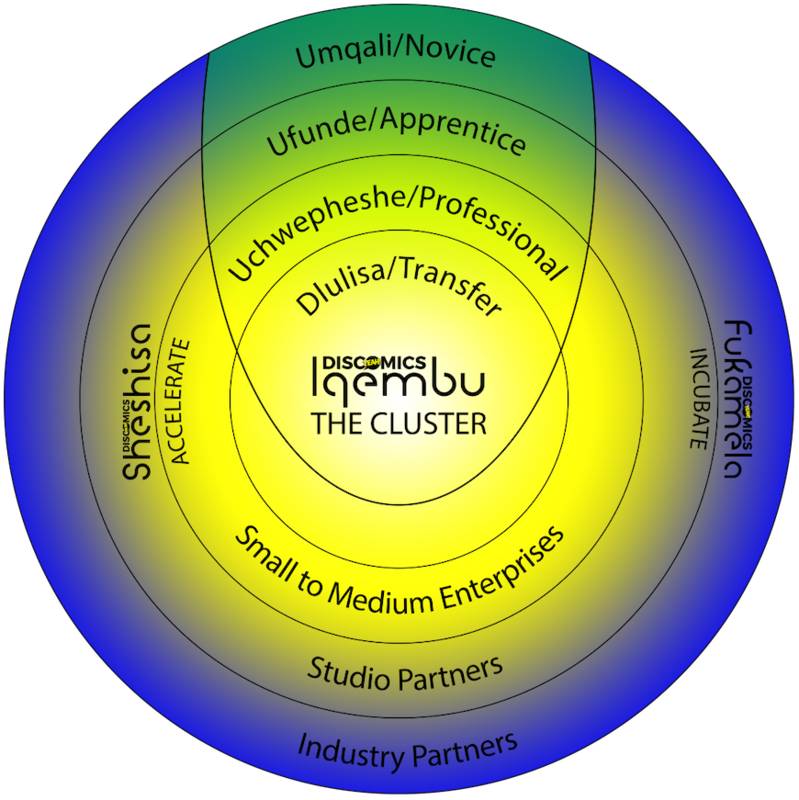 As part of our sustainability strategy, alumni of the Fukamela and Sheshisa will become functioning components of the DISCOMICS Iqembu developing and producing original African IP. They will participate in IP ownership through a process we call ‘dlulisa’, which means ‘to transfer’ in isiZulu. The cornerstone of long-term sustainability in content development and production is IP ownership and we aim to transfer ownership (or at least a significant portion) back to creators. This will ensure they benefit from the revenue generated from their efforts well into the future. Speaking of the future, where will DISCOMICS Iqembu be based? NW: We’re working on two scenarios concurrently for DISCOMICS Iqembu: a virtual cluster and another in a fixed location. In the case of a virtual cluster, we’d use web-based solutions like Toon Boom software for production purposes and offer training via webinars. This would allow us to be more inclusive but, ultimately, there is a lot of value derived from working in a fixed location and within a creative team. Because the majority of international broadcaster head offices are based in Johannesburg, it makes sense that we have DISCOMICS Iqembu and the Toon Boom Centre of Excellence here. That seems logical. Looking forward, what sets African animation apart from the rest of the world — and how does this increase its potential? NW: Africa has a wealth of natural creative talent and untapped human capital, but we need work to create a sustainable animation industry. It could be argued that the oral tradition, the art of storytelling, started in Africa and that’s what sets the continent apart from the rest of the world. Africa has incredible legends that are synchronous to those of Greek, Roman and Norse mythology but with uniquely African plots — conflicts, climaxes and resolutions. These haven’t been explored in any detail in international animation. I think that African stories, referencing African heritage and values, have the possibility to travel and resonate with audiences everywhere. Ready to start creating animation today? Start a free, 21-day trial of Toon Harmony now.